File photo. 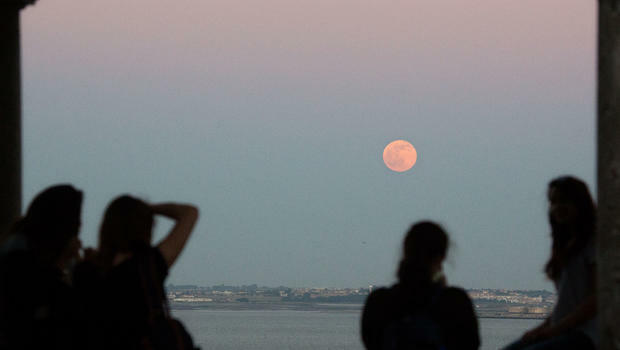 A group of girls watches a full Strawberry Moon, or Rose Moon, rise above the Tagus river in Lisbon Tuesday, June 2, 2015. The time of year so many kids (and adults) look forward to is here — summer is finally upon us. The summer solstice officially arrived at 6:34 p.m. EDT Monday. Solstice, the official start of summer, is the longest day of the year, and this year it also brings a rare event in the night’s sky. Those who look up at the moon tonight will see what’s called the “strawberry moon,” the nickname for June’s full moon, which happens to coincide this year with the summer solstice. In case you’re stuck indoors or the weather is cloudy, there’s a way to see it online. The Farmer’s Almanac and the Slooh network of robotic telescopes are teaming up to present a livestream of the full moon that can be viewed below starting 8 p.m. EDT. Happy Strawberry Moon & Summer Solstice. No wonder today was full of good news for my Team and I.